this room is vacant. and your smart thermostat knows it. DESIGNED FOR HOTELS. GUEST AWARE. 24/7 MONITORING. Delight Your Guests And Cut Your HVAC Energy Spend. Hotel energy management is more than thermostats with an occupancy sensor. Today, successful hotels run a network of smart thermostats that synchronize guest comfort with check-in events and HVAC operation – that’s hotel energy management. WiSuite delivers “save your rating” guest room comfort that also calibrates property HVAC systems to work at peak efficiency. With proactive, need-driven maintenance alerts, WiSuite can extend the useful life of some HVAC assets by more than 50%. The average hotel spends 6% of its operating costs on guest room energy. Control. It starts with our guest-friendly thermostat. 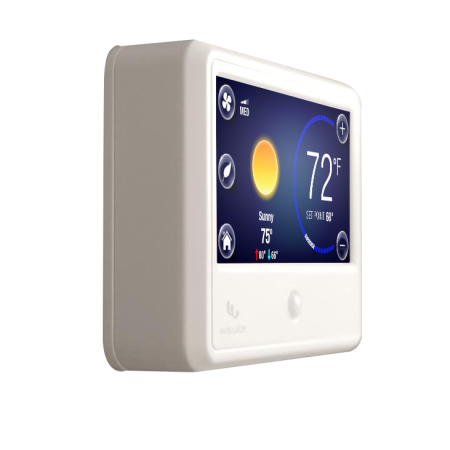 The WiSuite thermostat installs quickly with no revenue disruption; our simple, attractive design blends discretely into every décor. 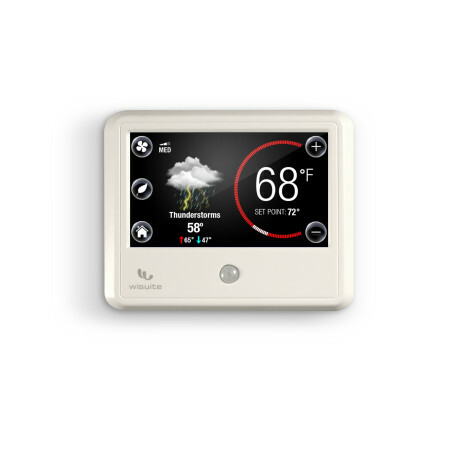 A colorful touch-screen that also displays up-to-the minute local weather. 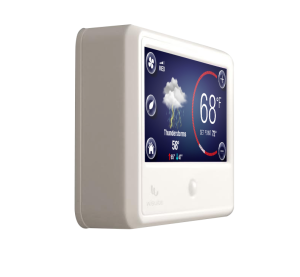 Networked by wireless mesh to our cloud control dashboard, engineering teams can resolve or adjust guest-room climate settings from any secure browser. Always on and connected, WiSuite captures data in real-time to feed analytics, alerts, and usage reporting; driving a continuous cycle of energy savings and sustainability. Over 40% of energy used for heating and cooling is wasted on rooms that are vacant over half the average day. America’s hotels spend almost $2,200 in energy costs per available room each year. WiSuite helps engineering teams run better. WiSuite helps engineering teams manage, troubleshoot and maintain property-wide HVAC systems from one central dashboard. Our customers achieve engineering team efficiency and improved guest satisfaction because they have.. The ability to set engineering alert thresholds based upon real-time room conditions. Access to an online engineering control panel to manage in-room and common space climate by tapping into WiSuite’s Smart Thermostat and in-room motion detection. 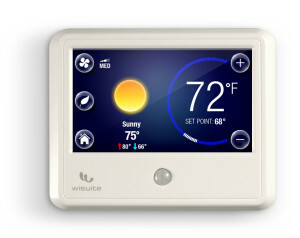 WiSuite increases guest satisfaction and extends the useful life of HVAC assets. Proactive alerts and maintenance schedules enable engineering staff to to stay ahead of HVAC issues before they ever surface as complaints. Energy savings that go beyond just a room. Operating the WiSuite thermostat is intuitive – studies show that both guests and engineering staff find its touch screen very easy to use. Also, to help brand recall, every thermostat is displays your property brand in high resolution. A property-wide WiSuite installation has a minimal energy footprint. In addition to auto-setting guest rooms to energy-savings mode at checkout, WiSuite’s platform generates useful property and room alerts analytics. 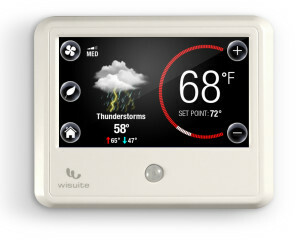 WiSuite captures guest energy preference to help you each room for maximum comfort. WiSuite’s building management system integration enables it to flag problems before they impact boiler and chiller investment via SMS and email. WiSuite’s analytics arm engineering teams with the data they need to proactively schedule room maintenance, filter changes and PTAC replacements.